Culture is something that we begin to learn at very early stages in life. It encompasses language, symbols, art, ideas, traditions, norms and behaviours. It also provides a sense of identity to an individual and plays a role in providing a community with social solidarity. When a cultural minority group is forced to take on a dominant cultures norm, this is called assimilation. This assimilation is exactly what took place in Native Residential Schools right across Canada. However for the intents and purposes of this paper I have chosen to focus mainly on Native groups in British Columbia, Canada. Natives were not viewed as individual groups in the government’s eyes. Instead the Inuit, Métis, and Mohawk tribes were all viewed as the same and believed to be culturally identical. Not only was this an issue but in 1867 during Confederation, Natives (non-whites) were deemed inferior to whites. In 1871, when British Columbia joined Confederation, natives were deemed as wards of the Federal Government. Then in 1892 the Federal Government and the Catholic Church formed a partnership in which they would run schools for Native youths. Although Native youths did indeed have a right to education, this was the commencement of a very strained and abusive relationship. 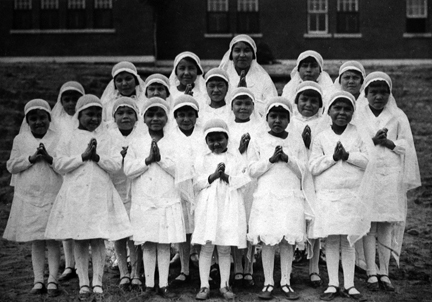 During the 1920’s in British Columbia it became mandatory for Native children to attend school. The problem with this is that these schools weren’t like the typical public schools that were attended by most children at the time. These schools were residential schools where many Native youths lost their sense of identity due to the cultural assimilation that took place. During this time, youths were taken from their family homes and placed in these institutions where they were not allowed to speak their native language, practice traditions or take part in any rites of passage rituals which they were accustomed to. Instead these children were fully immersed in a new culture where they were expected to learn and fully embrace a new language, new traditions, and new social norms. Claims have been made that if they were caught speaking their native tongues they would be physically reprimanded. The teachers/ educators at many of these schools were Catholic missionaries, who were interested in conversion and saving souls. The curriculum that was used in these residential schools was also not on a par with the public schools at this time. Native children spent less time in class and more time being “civilized” so that they may at some point become a “normal” part of society. These students were also kept at lower grades for longer periods of time and were not allowed to advance past the elementary levels of education (grade 8). The cultural assimilation of these Native youths has caused many to feel like they have lost part of their identity. Furthermore there have also been reports of physical, mental and sexual abuse that was said to have taken place in these institutions. Some academics have even posed the idea that correlations can be made between higher suicide rates in these youths and the abuse incurred at these residential schools. The Canadian government has publicly apologized for its involvement in this case of Residential schools, and Healing funds have been put in place (in 1998,to the amount of $350,000,000) as means of assisting the Youths affected by these residential schools. However, is this really enough to buy back someone’s past and assist in forgetting the horrible experiences that were imposed on these youths? Below are some interesting and informative links to the CBC archives that may further explain the effects of residential schools.